We are very proud to be carrying a full line of Di Camillo products. Di Camillo is a family run bakery with humble beginnings in Niagra Falls, New York delivering bread to neighbors in horse-drawn wagons. Di Camillo is still family run, into their fourth generation now, but their neighborhood has grown substantially! That is due in a large part to their dedication to making classic Italian cookies and confection without lowering their standards one iota. Our first introduction to Di Camillo was through their Biscotti di Vino nineteen years ago, and it continues to be one of our best selling products to date. This barely sweet biscuit, made with red wine and topped with sesame seeds, is always the best seller when we serve them at our wine tastings. It has gotten to the point where clients walk in to a tasting and ask, "Are you serving those wine biscuits?" We've tried imitators, but they don't come close to the taste of the real thing. In addition to tasting good, all Di Camilo products look great as well. 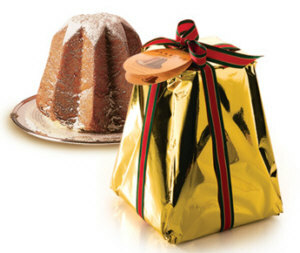 Their gorgeous ornate tins are popular gifts and we use them as centerpieces in several baskets. I can't wait to see them at the Food Show in New York to see what new packaging they've designed. 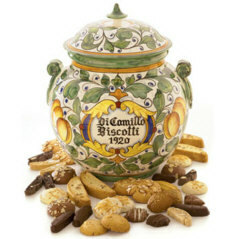 At the holidays we carry their Tuscan ceramic hand painted jars. Filled with an assortment of biscotti, macaroons (moist and chewy) and other cookies we have a hard time keeping their tins in stock. They are the perfect gift for a family or group. The tins live on long after the cookies are devoured. "Every product of the Di Camillo Baking Company derives from our family heritage, from our traditions, from our belief that exquisite foods lovingly prepared are not only an art form, but also an expression of life---reminders of past celebrations, heralds of celebrations to come."